Calder Brumen lives in San Francisco. He’s an artist obsessed with the portrait of dark haired mermaid. Calder believes Gaire is real, but his best friend thinks Calder is losing his mind. In pursuit of the truth, Calder stumbles into a murderous, underwater plot that could destroy them all. When I was asked to join the Falling in Deep Collective, I had no idea how to write about a mermaid. It had never occurred to me to write a paranormal romance. I spent a month trying to figure out how to write the most ridiculous thing. After brainstorming with two my author friends, I happened upon an outlandish idea. 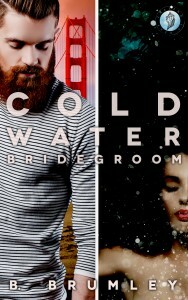 That became the big twist in the middle of Cold Water Bridegroom. Calder Brumen was inspired by UFC fighter Conor McGregor. I wasn’t ready to make a cage fighter the center of my romance (I will in a later book, I’m certain), so Calder became an artist living in San Francisco. Gaire was inspired by the character that William T. Riker fell in love with on an episode of Star Trek. Her name was Minuet. I looked for a name that suited her in Gaelic. In earlier version of Cold Water Bridegroom, Calder was looking for laughter, happiness. Gaire means laughter. Every nerve ending pricked beneath the silk dragging across his skin. Breath left his body as he strained toward the shapely figure now standing at his bedside. He groaned, but did not move. Her bare belly button hovered at eye level nestled just above the two curves of her pale hips that sloped down behind the edge of the mattress. Shadows hid her torso, but her green eyes glowed. The limited light illuminated only her silhouette, highlighting her womanly shape. “Gaire.” He spoke her name as a command, enunciating the hard “g” sound and sighing on the “air” sound in her name. Don’t make me wait again. She leaned forward so far that her ebony hair splashed across Calder’s middle. With each falling strand, Calder’s abdomen pulled tighter and tighter with anticipation. His eyes fixed on the moonbeam face, thirstily drinking in the view of her bottom lip clutched between her white teeth. When her tongue swiped across her mouth in a nervous gesture, he moaned. This is so real… This must be real. Keep her talking. Stay awake. The edges of the room twisted inward when Gaire’s fingers fluttered up his thigh. The scent of saltwater, coconuts, and jasmine grew stronger, lulling him and clouding his mind. His thoughts fell silent, swallowed by the warmth of her gentle lips on his. She murmured something against his mouth, but he could no longer understand the words drifting in the confusion her nearness wrought. Calder snorted and threw back his head as consciousness startled him. “Gaire,” he bellowed, already knowing. He glanced around the room through squinted eyes. The glaring sun streamed through the open sliding door. The white chiffon curtains fluttered in the wind, no other movement in the room and no response to his call. When he propped himself up on his elbows, bits of sand jumped along the edge of the king-sized bed. Real. She’s real, she’s always been real. He scrubbed a hand across his face. Small sandy footprints led toward the bed from the balcony, but none led away. Flashes of softness, warmth, bright red lips calling his name, feathery kisses on his chest, and down… Need crept across his body. I think I’ve finally gone insane.